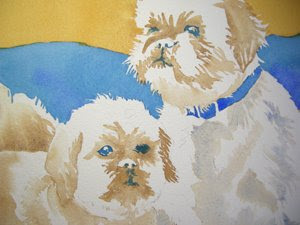 Using Prussian Blue, and a number 10 round brush with a good point, I painted in the darkest values of Scooter and Riley's faces. Be careful to only apply this pigment to areas that you want to appear very black. Either paint around the white sparkles or first use masking to save those areas. If you use masking, be sure to allow it to thoroughly air dry before applying any paint. These little white areas are very important to make the dark eyes sparkle and look as though they are moist and life-like. 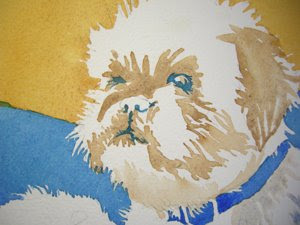 I also used some VanDyke Brown and Burnt Sienna to begin to develop a few more areas of shadow shapes around the dogs faces and bodies.